We’ll need to go through memory lane as I’m still in the midst of surgery recovery. The past week I’ve had the attention of the gnat and haven’t gotten anything accomplished. The thought was there, the motivation wasn’t. Digging out several unlabeled external hard drives, I figured it was high time I actually labeled them so I knew what was on there without having to open up a computer to do so. I’m also using DropBox.com to share my photo folders that I want the easiest access to. I decided the additional fee for 20 gigs was worth the great ease dropbox allows me to share files between computers and smart devices. I’ve been to some pretty fun places the past few years and I thought tripping down memory lane would be a good idea as new material is lacking. So…let’s travel to…the Louvre in gran Paris. Seems a little lady has an intriguing smile that has left generations wondering what she was thinking. She’s hard to capture as the guards keep all the visitors moving, and none are allowed to stop and spend time with her. So the view is fleeting and the moment elusive. Adding yet more mystery to this curious woman. Thanks Laurie ! So far so good. Had a couple of bad days, but was expected. Appreciate your well wishes Dorothy. Thanks! First in order: get well soon. Second: I like your shot of the Mona Lisa. Photographers, painters and bloggers ought to create such icons. Wouldn’t it be nice to write a post that was so often discussed and questioned? Sorry Beth, somehow your comment got lost in the shuffle. I wish I was smart enough to go in depth to analyze the Mona Lisa and what she means and represents. Appreciate your well wishes, and so far I’m doing quite well. I am neither an artist nor its implications, but I know what works for me. I minored in art in college; actually I should say I earned a teaching certificate. That is a far cry from being an expert. I once had dreams of being an artist and/or a writer, but life happened and I never was able to pursue my dream. It is just for the Mona Lisa as they don’t want to clog up the area in front of her. Slower today but still up and around. Thanks sweetie! Actually they are totally ok with one taking a photo of the Mona Lisa, so long as you don’t use flash. 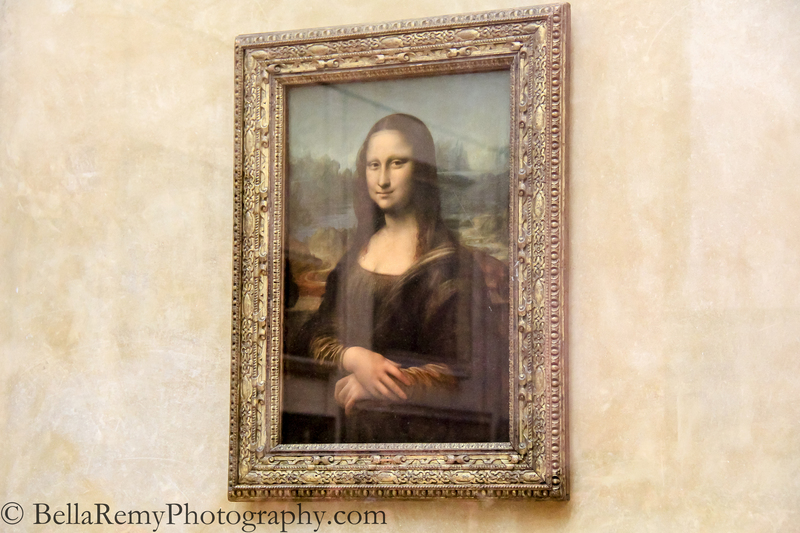 Believe me, there are sections where no photography is allowed in the Louvre, and they catch you immediately. Me too !! LOL ! When I was in high school – it was a Charter school – our French class took a trip to France (our teacher, also the principal was French). Of course we visited the Louvre…we had only an hour. I honestly don’t remember much about the actual art I saw mostly that it was an overwhelming place, incredible really even from outside. I think our own fast-paced race through the museum made it impossible to notice whether or not guards were moving people along. I don’t think I ever got to pay the lady a visit but I’m grateful we made it at all! You’re absolutely right ! Looking at old images is much more fun that cataloging. I’d do that anyday! We spent 3 hours with a guide that walked us back and for and gave us a art history lesson with the masterpieces within the main floor. Even then we didn’t even make a dent. We did get into the basement which was pretty cool and learned how it was once a castle for kings. Somehow think maybe a prison? But I could be making that up. Love paris and would love to go back! It was with a company called Paris Walks where there is no set fee. You pay the guide what you think their time is worth at the end. She was a art history student, and just loved sharing what she knows. It was really fun! Now you really painted a scene. Blue hair and disco boots ! Woo Hoo! A wild woman in Paris. Watch out! It was pretty funny, a little unsettling as I was much younger than the group of guys behind us! She wore us out. It was three full hours of really in depth art history. We’d walk back and forth to chronologically follow the development of art within the masters. I think she could have easily done 5 hours and still have tons left to share. Good luck with your recovery! Hope you are feeling better soon. I barely remember the Mona Lisa from my visit. Like you said, you can’t get very close to look at her. (And when I was there ~20yrs ago, you weren’t allowed to take photos!) I was far more interested in David’s “The Coronation of Napoleon” on the oppose wall which is absolutely amazing. Christina ! It’s wonderful to see you. I agree, that painting you mention is truly amazing. Talk about huge and so much detail and story in it. Thanks! Has anyone here heard of Stendhal Syndrome before? I happened to read about that recently and wondered how anyone could tell if such a reaction were genuine or faked.